My school gives each child a birthday pencil, but I would like to give my students a birthday card. However, buying them adds up too quickly and is not an option for me. So, I created a simple birthday card to use this year and a chart to help me keep up with all of the birthdays in my classroom. I am sharing it as today's Saturday Share. I hope you find it helpful. Just click on the pictures to grab these files. In addition to giving each student a card, I would really like to give them a special treat. This year I think I am going to give the students those beautiful balloon bouquets made with the large Pixie Sticks that have been on several blogs lately. What the Teacher Wants has a great post on how to make them. Of course, sometimes it is best to find sugar free alternatives, especially if you have a student with a restricted diet. The balloon bouquets can be made with curly straws, pens, or special pencils as an alternative. If you are interested in sugar free birthday celebration ideas, you should check out the No More Cupcakes post at Minds in Bloom. The Schroeder Page has a great post on her birthday box and special bithday chair cover. Another source for Some ideas and resources to help celebrate birthdays in your classroom with a great literature connection is Carolyn Wilhelm's post at Wise Owl Factory. 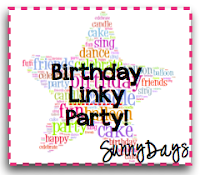 For even more ideas, check out the birthday linky party going on at Sunny Days in Second Grade. I'm linking up because I can always use more ideas.